For 2018, Panerai has unveiled a wide assortment of new models from the large and complex to the smaller and simpler. There’s quite a lot to unpack here, so let’s get right to it. Subscribe for the latest Rolex news. Officially named the Luminor 1950 Tourbillon Moon Phases Equation of Time GMT (PAM00920), the new Panerai L’Astronomo sports a massive 50mm brushed titanium case. 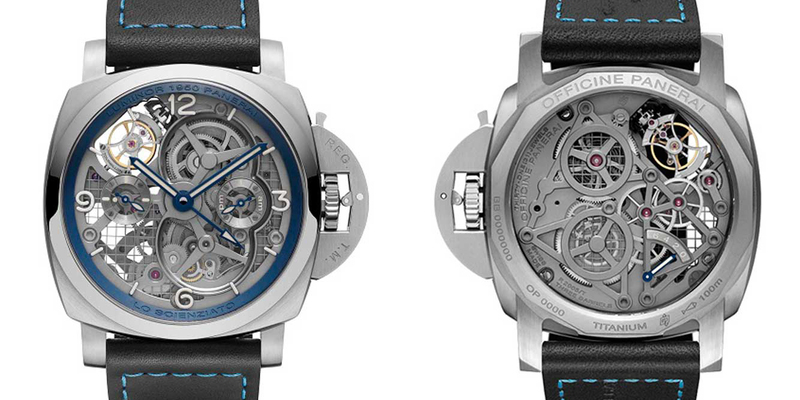 Housed within the case is a skeletonized dial for a full view of the in-house Caliber P.2005/GLS hand-wound movement. In addition to being the first Panerai watch with a moon phase indicator—which interestingly sits on the back of the watch—the PAM00920 also boasts the hours, minutes, small seconds, a polarized crystal date window, month display, GMT function, power reserve gauge, equation of time, and sunrise/sunset indicator. As a Panerai Luminor model, the watch, of course, comes with the signature lever-operated bridge protecting the winding crown. While this is a far cry from the simple time-only dials that Panerai became famous for, this is, in fact, the second Panerai L’Astronomo edition. The first one made its debut in 2010 sans moonphase display. 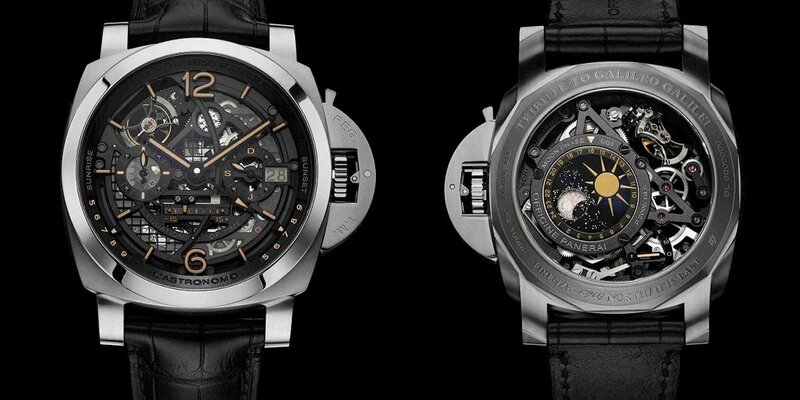 The second big reveal from Panerai is the new Panerai Lo Scienziato Luminor 1950 Tourbillon GMT Titanio (PAM00767). With this timepiece, Panerai continues to ride the 3D printing bandwagon by using a method called direct metal laser sintering to produce the ultra-light 47mm titanium case. This is actually Panerai’s second edition using this method as the first Panerai Lo Scienziato was introduced back in 2016. The two editions are practically identical, however, the new Panerai Lo Scienziato comes equipped with more blue details including the rehaut and the stitching on the leather strap. Aesthetic updates aside, the new PAM00767 still runs on the hand-wound Caliber P.2005/T with Panerai’s patented approach to the tourbillon mechanism, which makes a complete rotation every 30 seconds rather than the standard 60 seconds. This is thanks to the tourbillon cage rotating on an axis perpendicular to the balance instead of parallel to it. Along with the tourbillon, the watch also includes hours, minutes, small seconds, GMT, an am/pm indicator, and a power reserve display on the back. It’s no secret that there’s a prevailing trend in the luxury watch space right now for smaller watches. And if Panerai—the watchmaker most associated with oversized watches—is getting onboard, then we know this is a trend that will stick around for a while. For the first time, Panerai is now offering a 38mm sized watch, the Luminor Due 3 Days Automatic Acciaio 38mm, as part of their newish Luminor Due collection. Panerai launched the Luminor Due lineup back in 2016 as a dress watch alternative with slimmer cases and as a result, lower water resistance depths. Earlier models in the Luminor Due sported 45mm or 42mm cases, and now, with the introduction of the 38mm case, it’s a varied assortment of sizes to suit a range of wrists. Some are even calling the new 38mm size the ladies’ Panerai watch. The new Luminor Due 38mm Panerai watches run on the also new Caliber OPXXXIV automatic movement. There are actually eight new Luminor Due models for 2018 including two steel 38mm versions with different dial and strap colors (PAM00755 and PAM00903), a rose gold 38mm version (PAM00756), and another rose gold 38mm version (PAM00908) with a Chinese FU symbol caseback engraving. Quite different from the Panerai Radiomir we’ve covered previously. Furthermore, there are two new Luminor Due 3 Days Automatic Acciaio 42mm (PAM00904 and PAM00906) in different color configurations with hours, minutes, and small seconds. And finally, there’s also the new Luminor Due 3 Days Automatic Acciaio 45mm (PAM00943) and the new Luminor Due 3 Days GMT Power Reserve Automatic Acciaio 45mm (PAM00944). If the new complications, new 3-D printing tech, and new sizes are making your head spin, fear not. 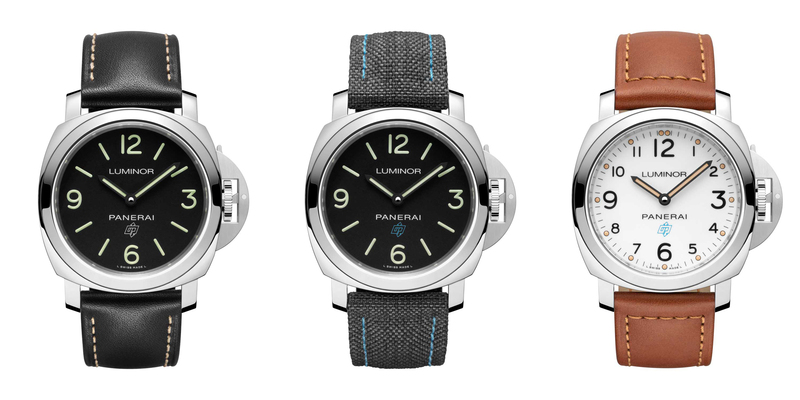 Panerai hasn’t neglected one of their most popular ranges—the Luminor Logo line. The collection that celebrates the minimal yet powerful design of Panerai has been updated to house the new manufacture Caliber P.6000 hand-wound movement. All six new models come with the characteristic 44mm sized Luminor case in a variety of colorways and on the dial sits the familiar Luminor Marina Logo. Three are base models (PAM00773, PAM00774, and PAM00775) with just the hour and minute hands on the dial while the remaining three (PAM00776, PAM00777, and PAM00778) include the running seconds too. What are your thoughts on the new Panerai releases? Do you like the new 38mm size? Leave us your thoughts in the comment section below. Paul is the company's Founder and CEO. He is responsible for all the day to day activities from purchasing, receiving, marketing and sales. Paul is a graduate of Boston College 1979 and resides in California with his family.